Like many people in this modern world, the struggle with the tension between the conveniences offered by the latest technology and the loss of privacy that comes with them. Nowhere is this devil’s bargain more evident than in the blossoming field of so-called contextual computing. Phones today are trying to anticipate my needs based on what it knows about me — the context of my life. And what it knows seems like almost everything. Your phone is constantly gathering what app developers call signals. These could be your commuting habits, which the phone can glean from its internal GPS, often within a few feet. Your phone could also gather your meetings, your future trips, your friends and family, your favorite sports team, the type of news you usually read and even things like your heart rate. Things really get interesting when the apps that gather these signals start to be predictive. When that happens, your phone can start anticipating your needs, interests and habits and give you relevant information, apps and even coupons and ads. These context-based devices and apps are already everywhere. 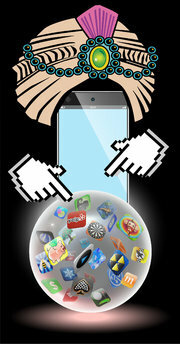 A generation of mostly brand-new apps is trying to add new conveniences by scanning your signals. The Nest thermostat, for example, is a context-aware device. It programs itself according to your schedule and can even tell whether someone is in the room. A coming speaker called the Aether Cone will analyze your listening habits to serve up the right music at the right time of day or week. Google Now is the best-known app for predicting what you will want to do. The app generated my morning traffic report, which pops up as a notification around the time I usually leave for work, or when traffic is particularly bad (which it is most days). It also shows sports teams, travel information, tech news and previous searches, as well as nearby locations or events. EverythingMe, available only for Android, does something Apple’s iOS will not allow: It takes over the home screen and then rearranges and recategorizes your apps. What EverythingMe does well is serve up a rotating collection of four home screen apps that change according to the time of day, my location and how often I use particular apps. In the morning, I get a custom icon, My Day, which shows calendar events and apps I use often in the morning, like Twitter. I might also see Traffic, Calendar and Hangouts, which I use for chatting with co-workers. In the future, phones will most likely be talking to wearables that are monitoring your movements, as well as things like your thermostats and even your cars. As the signals grow louder and more frequent, the context becomes more refined and accurate creating a next evolution of apps.